Get the blank data sheet here (takes you to Google Documents – use “File – Download As” on the Google Docs page to save it locally on your computer). Once you have entered data, please email the file (in .xls or .ods format) to project head Andy Farke (andrew.farke@gmail.com). NOTE: At present, a Google account is required to access this file. If you do not have a Google Account and do not desire one, you may email Andy (andrew.farke@gmail.com) for the file. Get the verification list here (takes you to Google Documents – use “File – Download As” on the Google Docs page to save it locally on your computer). Once you have entered data, please email the file (in .xls or .ods format) to project head Andy Farke (andrew.farke@gmail.com). NOTE: At present, a Google account is required to access this file. If you do not have a Google Account and do not desire one, you may email Andy (andrew.farke@gmail.com) for the file. Download the current measurement table here (takes you to Google Documents – use “File – Download As” on the Google Docs page to save it locally on your computer). NOTE: At present, a Google account is required to access this file. If you do not have a Google Account and do not desire one, you may email Andy (andrew.farke@gmail.com) for the file. The get the pared-down data for analysis, check out this link. NOTE: At present, a Google account is required to access this file. If you do not have a Google Account and do not desire one, you may email Andy (andrew.farke@gmail.com) for the file. Download or edit the current list of taxonomic synonyms and institutional abbreviations. To simplify things, these files may be edited online. NOTE: At present, a Google account is required to access this file. If you do not have a Google Account and do not desire one, you may email Andy (andrew.farke@gmail.com) for the file. To learn how to use these files, check out the How-To Guide. Might I suggest that you create a standard list of clade names and definitions for people to work off of? This way everyone uses the same names with the same content. Otherwise, you (the project leaders) will have to expend significant time making the supra-generic taxonomy consistent across all data. Or (better still IMHO) just fill in the genus and species, and leave the Clade column blank: we will have to put all the taxa into a unified phylogeny anyway, so the individual papers’ authors’ ideas of what clade each genus belongs to is going to get ignored — why even fill it in? Another thing that would be useful: when giving the citation for the paper that measurements were found in, give the page number as well as authors and year: so “Ostrom 1970:123”, not just “Ostrom 1970”. That will make it easier for verifiers to find the relevant place. Mike – that is a much more elegant solution. And I agree that citing the page number and/or table number in the publication will be super helpful. Agreed, Mike–sent over some of the relevant page numbers of the data I sent. Thanks, people — we really are figuring this out as we go along. Good points, Randy. 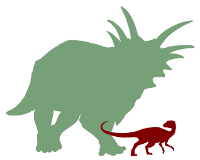 For right now, I’m just using very, very rough (and often non-comparable) clade descriptors (Hadrosauridae, Ceratopsia, Thyreophora, Stegosauria, etc.). The names at present will have no bearing on the eventual analysis (most likely), but are merely an organizational tool. Of course, we will want to standardize a phylogeny at some point in the not-too-distant future, in order to do some of the requisite comparative analyses. Can you post a list of full citations of papers already entered? It might make it easier to ferret out the remaining papers. The problem right now is that the data in the two Excel spreadsheet are in no particular order, so its very difficult to ensure you’ve got a new ref that hasn’t been entered already. Hi, I will like to create a map with all dinosaur, togheter with my child, Do you have any complete or incomplete list wiht locations for country and city? Great! I’m specialist in data analytics and visualization, my son is dino fan and we would like to create a map whit this information so we will share results whit you wen we finish it. Regards from Argentina! Thanks!